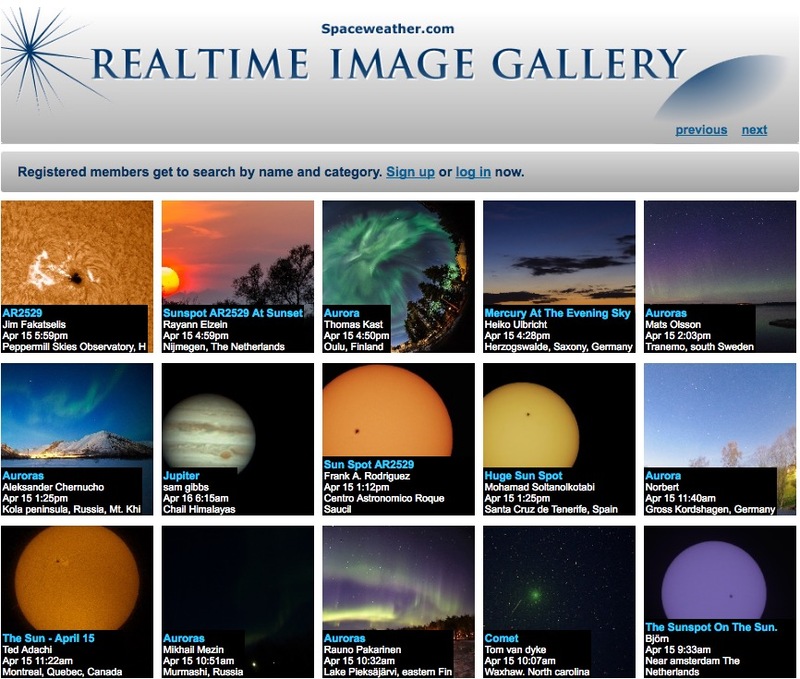 Wednesday 10 April 2019 was a big day for the astronomy community. 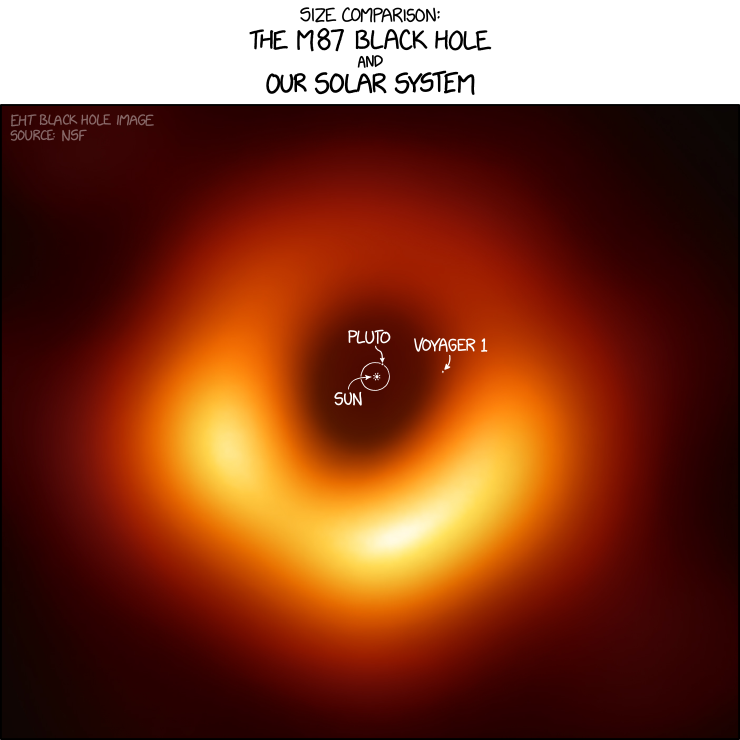 Information was presented from the Event Horizon Telescope (EHT) project revealing new details about the super-massive black hole in galaxy M-87. The intent of this post is to offer some perspective helpful to those who are not experts in this field. Prior to the news release, I read a very comprehensive and helpful blog post by physicist Matt Strassler. His post addressed questions that were likely to be asked by the non-expert about the significance and details of the announcement. Some points he made were useful in the writing of this post. Where is M-87? How Big and Far? The stars in galaxy M-87 are more than 53 million light-years distant. Imaged here by the Hubble Space Telescope, an energetic jet is seen emerging from its core. This jet is produced by the black hole at the core of the glowing island of stars. If you could see faint M-87 with your naked eye, it would appear 1/20th the width of a full moon. The black hole at the core is many many times smaller than M-87. Seen from Earth, the black hole size compares to reading the print on a quarter in California as viewed from New York. Or, it is like viewing one grain of sand on a beach from a jetliner at 30,000 ft. Viewing and measuring such small objects requires the use of the widest aperture instruments. The wider the aperture, the finer the detail that can be resolved. That is why telescopes today are so large. The EHT project used multiple radio telescopes on opposite sides of the Earth simultaneously to simulate one huge telescope with an aperture as wide as Earth itself. Making many such widely distant observations allowed them to resolve the details of the activity which was happening near the black hole. The published image is the best composite of data from those many observations. The orange color and intensity in the image are artificial as our eyes cannot see radio waves. They are introduced to illustrate the radio field intensity. News stories claimed it was the first image of a black hole. Well, that is technically not true. Black holes emit no light or radiation of any kind making them invisible to any detectors. However, they do create immensely powerful influences on the matter and space in the regions nearby which are visible to a variety of detectors. The EHT project was able to show those influences extremely close to the black hole in a place called the event horizon. Their work, more precisely than ever before, defined the location and size of the black hole within the event horizon of the M-87 galaxy. It is within the center of the glowing donut ring in the top image. It has a diameter of less than 2 light-days based on the measurements of the region. A light-day is the distance light, or any electromagnetic radiation, travels in a day. Our solar system diameter based on the orbit of Neptune is about 0.35 light-days across. The M-87 black hole is on the order of 5 or 6 solar system diameters across with a mass of more that 6 billion times the mass of our Sun according to EHT. The following image from the webcomic xkcd puts the size in perspective relative to the orbit of Pluto and location of Voyager 1 launched in 1977. As matter goes into a black hole, it passes a point-of-no-return called the event horizon. The region is described by the mathematics and models of gravitation and relativity too difficult for me to explain. I will instead offer an analogy that might illustrate the concept. Imagine you are upstream of Niagara Falls watching a person in a small motorboat speeding around on the water. The relatively slow river current allows their little boat to go freely about. They don’t realize the river is carrying them with increasing speed toward the precipice of the falls. The boat is carried closer to the edge. At some point, the driver realizes their problem and tries to drive away from the falls. The current is carrying the water with the boat faster than the boat can go in the water. You see it go over the edge and disappear beyond the event horizon of the falls. Matter flows with the fabric of spacetime as it enters the region of a black hole. It is almost like an enormous whirlpool drawing stuff into it. Unlike the little boat, the fastest speed anything can have is the speed of photons of light, radio waves, x-rays, etc. As matter passes the event horizon of the black hole, even the speed of light is not fast enough for the photons to escape. The objects enter, never to be seen again. The European Space Agency released the following video containing graphics of the whirlpool of activity centered on the M-87 black hole. It is set to start at the time of those graphics. Watch for 2 minutes. Excellent summary, Jim. I enjoyed it very much. I wonder if there is any limit to the size of a black hole? What would happen if all the matter in the universe condensed into a black hole? I think that visual depictions of galaxies are necessarily misleading because of scale. Galaxies do collide but when they do, actual collisions of stars only rarely occur because the distances between them are so great. Collisions of black holes are even more rare. I believe that happens only a few times a month or year, if I remember correctly. You raise some good points, Jim. That second one I’ve seen referred to as the ‘Big Crunch’. We’ll probably miss out on it. You’re right about the galaxy collisions. There are images of what appears to be the remnants of their collisions. Gravitational interactions tear at their structure. The LIGO projects are detecting those black hole collisions. They are spectacular events. The detectors have been upgraded to more sensitivity. More detections are being recorded. Yes…Einstein rocks. What a guy he was. Thank you for reading and your good comments. It was good to see you. I like the size comparison image a lot. that adds a lot from my perspective. Informative article – pretty heady for a rocks and fossils guy! Once again astronomy astounds. I can barely imagine a parsec! If your able to comprehend, there’s a steak dinner and a $500 bottle of wine in it for you and Melanie. Now I am really motivated. I haven’t had a good steak in a while. Bonus to the wine. Ugh! There will be no steak dinner or wine for us. I sort of thought I made a safe bet. Awesome post! It is an astonishing photo. !